Life has been busy over the past month—a fact epitomised by me having to travel up and down to the 2010 TAG conference this year in a single day. In the process, I missed seeing virtually all of the event, and of course, missed all but the first 15 minutes of the annual party. Even though my time there was so short, I was still reminded of what I like most about TAG: the young, energetic atmosphere; the sense of learning that’s cultivated by the university classroom-based sessions; the mix of senior and junior scholars and practitioners; the supportive yet still critical audience. The session in which I participated—hosted by the UCL-based Centre for Audio-Visual Study and Practice in Archaeology (CASPAR)—was excellent, with significant periods of questioning and discussion. For me, this conversational time made the event quite distinctive, complemented by the fact that it included (both in the audience and amongst the presenters) some of the archaeologists whose work has been most influential on my own. I actually think the session deserves deeper intellectual exploration, as it featured multiple themes that struck me as running through the various talks, like accountability, experimentation, viewership, and governmental support and public response to the overall archaeological project. Indeed, of the few papers that I saw, those by Wickstead, Tringham, Morgan, Pett, Smith and Bonacchi touched on more than one—and sometimes all—of these topics. More so, though, there were multiple other sessions at TAG this year (which I either missed or which ran concurrently) whose content converged with ours. 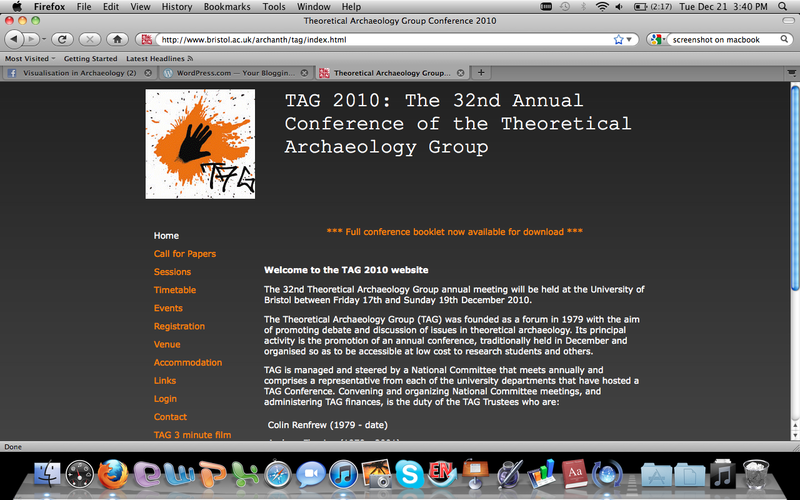 These include one organised by my friends and colleagues Angeliki Chrysanthi, Pati Murrieta Flores, and Costas Papadopoulos from Southampton on Archaeological Computing and the Interpretative Process, as well as Mhairi Maxwell’s and Pat Hadley’s session on Possible Futures for Archaeology and Creative Work. What strikes me here are both the mass and the momentum that currently underlie visual-orientated studies in archaeology. As discussed during the CASPAR session, ideally such energy and weight of knowledge-making would be capitalised on in the future as disciplinary agendas are negotiated and concretised. Certainly, we’re aiming to do this through VIA, but the conversation extends much further, I think. There are so many other things that have happened since my last post in November, but I’ll just note some of them in point form here and return to discuss them further in the upcoming weeks. Firstly, the University finally published the little piece about our work at Çatalhöyük, which can be viewed online here (see pp. 20-25). Secondly, we have just launched a basic webpage for the Alan Sorrell Project. This will be followed in the early new year with a dedicated blog, to which we hope people will feel comfortable to contribute their memories of Sorrell and their thoughts about the past, present and future of archaeological visualisation. Lastly, Jonathan Marion’s and my article on visual ethics in anthropology has just been published in the journal Visual Anthropology Review. Here is the abstract, and please get in touch if you have any interest in seeing the full paper. Happy holidays to all & looking forward to blogging again in early 2011!